And this, my friend, may be conceived to be that heavy, weighty, earthy element of sight by which such a soul is depressed and dragged down again into the visible world, because she is afraid of the invisible and of the world below-prowling about tombs and sepulchers, in the neighborhood of which, as they tell us, are seen certain ghostly apparitions of souls which have not departed pure, but are cloyed with sight and therefore visible. While ghosts have long haunted the minds of humans, philosophers have said relatively little about them. Plato, in the Phaedo, did briefly discuss ghosts in the context of the soul. Centuries later, my “Ghosts & Minds” manifested in the Philosophers’ Magazine and then re-appeared in my What Don’t You Know? In the grand tradition of horror movie remakes, I have decided to re-visit the ghosts of philosophy and write about them once more. The first step in these ghostly adventures is laying out a working definition of “ghost.” In the classic tales of horror and in role playing game such as Call of Cthulhu and Pathfinder ghosts are undead manifestations of souls that once inhabited living bodies. These ghosts are incorporeal or, in philosophical terms, they are immaterial minds. In the realm of fiction and games, there is a variety of incorporeal undead: ghosts, shadows, wraiths, specters, poltergeists, and many others. I will, however, stick with a basic sort of ghost and not get bogged down in the various subspecies of spirits. A basic ghost has to possess certain qualities. The first is that a ghost must have lost its original body due to death. The second is that a ghost must retain the core metaphysical identity it possessed in life. That is, the ghost of a dead person must still be that person and the ghost of a dead animal must still be that animal. This is to distinguish a proper ghost from a mere phantasm or residue. A ghost can, of course, have changes in its mental features. For example, some fictional ghosts become single-mindedly focused on revenge and suffer a degradation of their more human qualities. The third requirement is that the ghost must not have a new “permanent” body (this would be reincarnation), although temporary possession would not count against this. The final requirement is that the ghost must be capable of interacting with the physical world in some manner. This might involve being able to manifest to the sight of the living, to change temperatures, to cause static on a TV, or to inflict a bizarre death. This condition can be used to distinguish a ghost from a spirit that is in a better (or worse) place. After all, it would be odd to say that Heaven is haunted. Or perhaps not. While the stock ghost of fiction and games is incorporeal entity (an immaterial mind), it should not be assumed that this is a necessary condition for being a ghost. This is to avoid begging the question against non-dualist accounts of ghosts. Now that the groundwork has been put in place, it is time to move on to the ghosts. The easy and obvious approach to the ghosts of philosophy is to simply stick with the stock ghost. This ghost, as noted above, fits in nicely with classic dualism. This is the philosophical view that there are two basic metaphysical kinds: the material stuff (which might be a substance or properties) and the immaterial stuff. Put in everyday terms, these are the body and the mind/spirit/soul. On this view, a ghost would arise upon the death of a body that was inhabited by a mind. Since the mind is metaphysically distinct from the body, it would be possible for it to survive the death of the body. Since the mind is the person, the ghost would presumably remain a person—though being dead might have some psychological impact. One of the main problems for dualism is the mind-body problem, which rather vexed the dualist Descartes. This is the mystery of how the immaterial mind interacts with the material body. While this is rather mysterious, the interaction of the disembodied mind with the material world is really not anymore mysterious. After all, if the mind can work the levers of the brain, it could presumably interact with other material objects. Naturally, it could be objected that the mind needs a certain sort of matter to work with—but the principle of ghosts interacting with the world is no more mysterious than the immaterial mind interacting with the material body. Non-dualist metaphysical view would seem to have some clear problems with ghosts. One such view is philosophical materialism (also known as physicalism). Unlike everyday materialism, this is not a love of fancy cars, big houses and shiny bling. Rather, it is the philosophical view that all that exists is material. This view explicitly denies the existence of immaterial entities such as spirits and souls. There can still be minds—but they must be physical in nature. On the face of it, materialism would seem to preclude the existence of ghosts. After all, if the person is her body, then when the body dies, then that is the end of the person. As such, while materialism is consistent with corporeal undead such as zombies, ghouls and vampires, ghosts would seem to out. Or are they? One approach is to accept the existence of material ghosts—the original body dies and the mind persists as some sort of material object. This might be the ectoplasm of fiction or perhaps a fine cloud. It might even be a form of energy that is properly material. These would be material ghosts in a material world. Such material ghosts would presumably be able to interact with the other material objects—though this might be rather limited. Another approach is to accept the existence of functional ghosts. One popular theory of mind is functionalism, which seems to be the result of thinking that the mind is rather like a computer. For a functionalist a mental state, such as being afraid of ghosts, is defined in terms of causal relations it holds to external influences, other mental states, and bodily behavior. Rather crudely put, a person is a set of functions and if those functions survived the death of the body and were able to interact in some manner with the physical world, then there could be functional ghosts. Such functional ghosts might be regarded as breaking one of the ghost rules in that they might require some sort of new body, such as a computer, a house, or a mechanical shell. In such cases, the survival of the function set of the dead person would be a case of reincarnation—although there is certainly a precedent in fiction for calling such entities “ghosts” even when they are in shells. Another option, which would still avoid dualism, is for the functions to be instantiated in a non-physical manner (using the term “physical” in the popular sense). For example, the functional ghost might exist in a field of energy or a signal being broadcast across space. While still in the material world, such entities would be bodiless in the everyday meaning of the term and this might suffice to make them ghosts. A second and far less common form of monism (the view that there is but one type of metaphysical stuff) is known as idealism or phenomenalism. This is not because the people who believe it are idealistic or really phenomenal. Rather, this is the view that all that exist is mental in nature. George Berkeley (best known as the “if a tree falls in the forest…” guy) held to this view. As he saw it, reality is composed of minds (with God being the supreme mind) and what we think of as bodies are just ideas in the mind. Phenomenalism would seem to preclude the existence of ghosts—minds never have bodies and hence can never become ghosts. However, the idealists usually provide some account for the intuitive belief that there are bodies. Berkeley, for example, claims that the body is a set of ideas. As such, the death of the body would be a matter of having death ideas about the ideas of the body (or however that would work). Since the mind normally exists without a material body, it could easily keep on doing so. And since the “material objects” are ideas, they could be interacted with by idea ghosts. So, it all works out. While the truly classic werewolf is a human with the ability to shift into the shape of a wolf, the movie versions typically feature a transformation to a wolf-human hybrid. 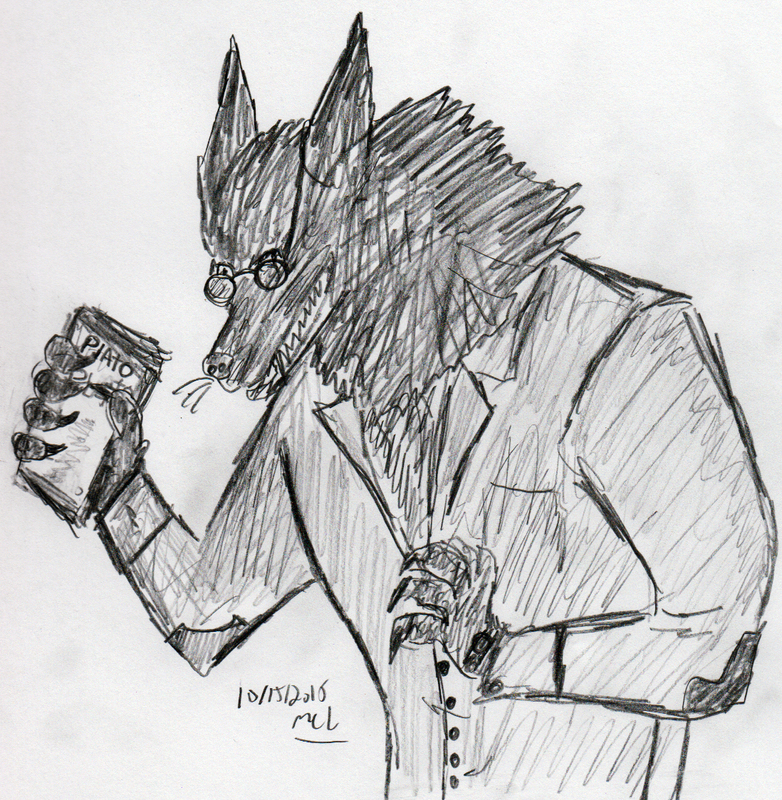 The standard werewolf has a taste for human flesh, a vulnerability to silver and a serious shedding problem. Some werewolves have impressive basketball skills, but that is not a stock werewolf ability. There have been various and sundry efforts to explain the werewolf myths and legends. Some of the scientific (or at least pseudo-scientific) include specific forms of mental illness or disease. On these accounts, the werewolf does not actually transform into wolf-like creature. The werewolf is merely a very unfortunate person. These non-magical werewolves are certainly possible, but are far more tragic than horrific. There are also many supernatural accounts for werewolves—many involve vague references to curses. In many tales, the condition can be transmitted—perhaps by a bite or, in modern times, even by texting. These magical beasts are certainly not possible—unless, of course, this is a magical world. There has even been some speculation about future technology based shifters—perhaps by some sort of nanotechnology that can rapidly re-structure a living creature without killing it. But, these would be werewolves of science fiction. Interestingly enough, there could also be philosophical werewolves (which, to steal from Adventure Time, could be called “whywolves”) that have a solid metaphysical foundation. Well, as solid as metaphysics gets. Our good dead friend Plato (who was probably not a werewolf) laid out a theory of Forms. According to Plato, the Forms are supposed to be eternal, perfect entities that exist outside of space and time. As such, they are even weirder than werewolves. However, they neither shed nor consume the flesh of humans, so they do have some positive points relative to werewolves. For Plato, all the particular entities in this imperfect realm are what they are in virtue of their instantiation of various Forms. This is sometimes called “participation”, perhaps to make the particulars sound like they have civic virtue. To illustrate this with an example, my husky Isis is a husky because she participates in the form of Husky. This is, no doubt, among the noblest and best of the dog forms. Likewise, Isis is furry because she instantiates the form of Fur (and shares this instantiation with all things she contacts—such is the vastness of her generosity). While there is some pretty nice stuff here in the world, it is sadly evident that all the particulars lack perfection. For example, while Donald Trump’s buildings are clearly quality structures, they are not perfect buildings. Likewise, while he does have a somewhat orange color, he does not possess perfect Orange (John Boehner is closer to the Form of Orange, yet still lacks perfection). Plato’s account of the imperfection of particulars, like Donald Trump, involves the claim that particulars instantiate or participate in the Forms in varying degrees. When explaining this to my students, I usually use the example of photocopies of various quality—perhaps arising because of issues with the toner. The original that is copied is analogous to the Form while the copies of varying quality are analogous to the various particulars. Another example could be selfies taken of a person using cameras of various qualities. I find that the cools kids relate more to selfies than to photocopies. Plato also asserts that particulars can instantiate or participate in “contrasting” Forms. He uses the example of how things here in the earthly realm have both Beauty and Ugliness, thus they lack perfect Beauty. To use a more specific example, even the most attractive supermodel still has flaws. As such, a person’s beauty (or ugliness) is a blend of Beauty and Ugliness. Since people can look more or less beautiful over time (time can be very mean as can gravity), this mix can shift—the degree of participation or instantiation can change. This mixing and shifting of instantiation can be used to provide a Platonic account of werewolves (which is not the same as having a Platonic relation with a werewolf). If the huge assumptions are made that a particular is what it is because it instantiates various Forms and that the instantiations of Forms can be mixed or blended in a particular, then werewolves can easily be given a metaphysical explanation in the context of Forms. For Plato, a werewolf would be a particular that instantiated the Form of Man but also the Form of Wolf. As such, the being would be part man and part wolf. When the person is participating most in the Form of Man, then he would appear (and act) human. However, when the Form of Wolf became dominant, her form and behavior would shift towards that of the wolf. Plato mentions the Sun in the Allegory of the Cave as well as the light of the moon. So it seems appropriate that the moon (which reflects the light of the sun) is credited in many tales with triggering the transformation from human to wolf. Perhaps since, as Aristotle claimed, humans are rational animals, the direct light of the sun means that the human Form is dominant. The reflected light of the full moon would, at least in accord with something I just made up, result in a distortion of reason and thus allow the animal Form of Wolf to dominate. There can also be a nice connection here to Plato’s account of the three-part soul: when the Wolf is in charge, reason is mostly asleep. While it is the wolf that usually takes the blame for the evil of the werewolf, it seems more plausible that this comes from the form of Man. After all, research of wolves has shown that they have been given a bad rap. So, whatever evil is in the werewolf comes from the human part. The howling, though, is all wolf.